This editorial is written in the middle of a strike in UK academia. I sincerely hope that by the time this appears, a satisfactory solution will have been found, but at the moment I am rather sceptical. The strike seems to be the culmination of a series of political events that have deep influence on academic life, and although the formal reason for strike is the proposed changes to pensions of UK academic staff, these pensions also represent broader problems in contemporary academia and its financing system. Next to pension problems sit vast increases in student fees and huge salaries for vice-chancellors (see also https://www.theguardian.com/education/2018/mar/11/university-vice-chancellors-are-paid-far-more-than-public-sector-peers?CMP=share_btn_tw). This of course is all interlinked with forms of metric based governance, expressed in rankings, indexes and evaluation systems, including REF and TEF. These problems are specific to the UK while to some extent mirrored in other countries too. Here is an important question that arose for me and my colleagues: How can we as academics effectively protest and change the ways in which universities are governed? Is disrupting teaching the most effective way to give a message to the management, or are there other ways to disrupt administration? In any case, with cancelled classes and supportive students, the reactions of university managers were often absent or remarkably slow. Some sense of urgency came only weeks into the announcement and the actual strike, but without any satisfactory solution so far. This is especially disconcerting since the university management is largely composed of academics and as such reflects some deep problems in our own community which already have been excellently addressed in recent Manifestos by colleagues from Aberdeen (https://reclaimingouruniversity.wordpress.com) and the Netherlands (https://link.springer.com/article/10.1007/s11024-015-9270-9). In the UK action and debates took place in various spaces: on the picket line, through empty lecture halls and offices, during teach-outs, through the occupation of buildings, and on twitter. The strike was occupying the digital space too. 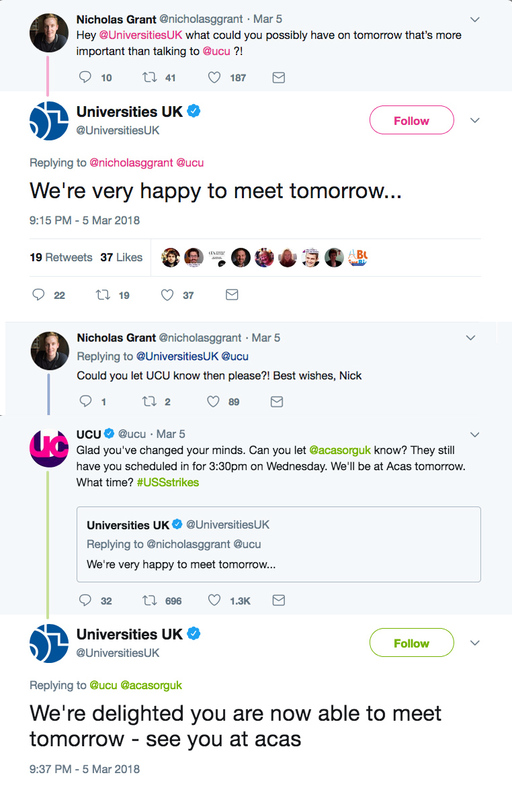 Twitter was actually the best source of information on the strike, providing a value that is often unclear (see for many examples #ucu on twitter). As an STS-er in another country, one is always somewhat of an outsider, while trained in ethnographic methods too, and as such I spent some time trying to understand the UK system in strike mode. My early field notes are full of surprise. Especially concerning the amount of rules and regulations that different parties stipulate. I will not go into detail here, but it certainly comes across as a very disciplined strike, in which different strike levels can be subscribed to, requiring careful registration. To me, this seems a bit against the idea of rebellion and unruliness that goes with striking, and I think I would prefer a simple strike: no work – none whatsoever! – till a solution is found. Twitter was a means to check what actually happened. Here I could find information about motivations and actions, about the different organisations involved, about the ways in which my own university handled the situation, and what was taking place at other universities. These tweets are brilliant research material (who takes this up? ), and show the emotional engagement – including anger, frustration, and hope – covered with some good sense of British humour. And even the negotiations were at one point arranged through a twitter exchange (see below), perhaps in line with contemporary politics but I could not believe my eyes. The importance of (virtual) spaces for debates and actions also became a main discussion point during the meeting ‘Science, Technology and Public Value: Beyond responsible innovation?’ organised by the Biotechnology and Society Research Group at King’s College Department of Global Health & Social Medicine. In a wonderful meeting space called ‘Wallacespace’ in the heart of London, we gathered around tables to search for positive ways forward based on experiences with RRI type of research. We reflected on the importance of space for interaction, and how the spatial design can enhance both formal and informal exchanges. This connects to my own work on the Francis Crick Institute which is especially designed to enhance collaboration, and it is of course also relevant when thinking about interactions between (social)scientists, stakeholders and publics. What would be the way forward here?Do we need to complement common time with common space, or is it about inviting each other in our own familiar space, or creating a new common home? Another important discussion evolved around the occupation of epistemic spaces, and how the process of priority setting is an important place to analyse and influence (see colleagues Ismael Ràfols and Jack Stilgoe on priorities in biomedical research: https://www.theguardian.com/science/political-science/2018/mar/16/who-benefits-from-biomedical-science). Within our own academic community spaces for debate and discussion are crucial too. We need to, for instance, pay attention to the identity of scientists, and the education of new generations of researchers within transforming academic environments. The relations between community and identity in contemporary techno-science was on the agenda in workshop in Vienna last year, supported by EASST funds and reported on in this issue by organiser Karen Kastenhofer of the Institute of Technology Assessment (ITA) and the Austrian STS network (see also http://www.sts-austria.org/events/). One of its key members, the STS department of the University of Vienna is celebrating its 30th birthday with an academic party: congratulations Helga, Uli, Max and all colleagues! Within a community that studies the interaction between science and society, it is no surprise that political and social developments are permeating academia. However, recent events such as the science marches (see colleague Bart Penders on this topic: https://doi.org/10.15252/embr.201744935), the UK strike and the effects of brexit do not only require action but also analysis and reflections. Thereby it seems important to have an academic platform outside of twitter, where discussions and debates on these developments can take place. The British strike action fell together with what has been named, the ‘big freeze’, or the ‘beast from the east’ which added to disruptions in life, but at the moment the last snow is melting under the sunshine and we are awaiting Spring. Here is hoping for some positive (green)energy in the months to come! Niki Vermeulen specialises in science and innovation policy and the organisation of research, with an emphasis on scientific collaboration in the life sciences. 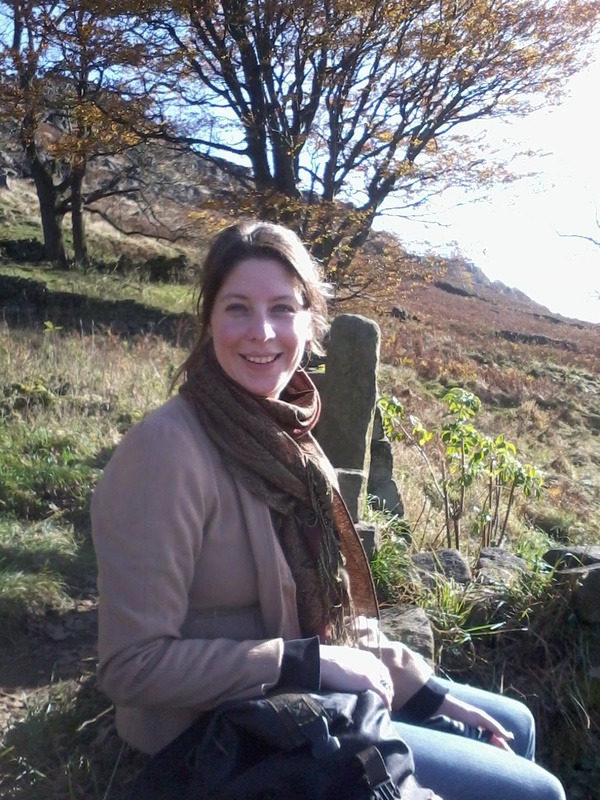 She is part of the Science, Technology and Innovation Studies (STIS) group at te University of Edinburgh and associate researcher of the Centre for Science and Technology Studies (CWTS) of Leiden University. She holds a PhD in Science and Technology Studies from Maastricht University, was a Marie Curie research fellow in the Science and Technology Studies Unit at the University of York, lecturer/researcher in the Department of Science and Technology Studies, University of Vienna, and research fellow in the Centre for the History of Science, Technology and Medicine of the University of Manchester. She recently developed Curious Edinburgh, a walking tour through Edinburgh’s rich scientific heritage (see www.curiousedinburgh.org).